Along with Charlie Chaplin and Buster Keaton, Harold Lloyd was one of the most popular movie stars of the silent film era with Safety Last! 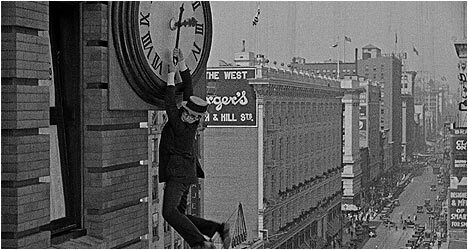 (1923) being one of his signature movies and the shot of him hanging precariously off a tall building’s clock face one of its most iconic images. During his silent era (1922 – 1928), Lloyd’s movies were consistently high-grossing box office hits. His everyman quality and ability to smile in the face of adversity struck a chord with audiences. That, and, of course, his uncanny knack for physical comedy, which endeared him with filmgoers of the day. Lloyd plays a young man heading off to the big city, promising to send for his girlfriend (Davis) once he’s made it. A few months later and he’s scraping by with the rent due and no way to pay it. He sends his girl letters every day reassuring her that he’s making progress, afraid to tell the truth and let her down. The first elaborate action sequence sees Lloyd trying to get to work and avoid being fired. At first, he tries, in vain, to board an overcrowded trolley and then hop a ride in a nearby passing car only to smuggle his way on an ambulance posing as an injured man. Lloyd had an incredibly expressive face and was a very physical actor – the two most important traits for a silent movie star. Despite doing things that portray his character as something of a troublemaker, Lloyd’s facial expressions and how he uses them when faced adversity, give him an everyman quality that made him very popular back in the day. His character soon runs afoul of the law (Young) and his boss (Clarke), but he always manages to find creative solutions to the problems that face him. In an attempt to make a lot of money quickly and impress his girlfriend, Lloyd, inspired by his buddy’s (Strother) climb up the side of a building to avoid a beat cop, hatches a stunt for him to do it on the department store building he works at. However, the next day, his buddy gets drunk and runs into the cop he evaded and through a comedy of errors it is Lloyd who climbs the building! The new Criterion Collection transfer on Blu-Ray is astounding in its contrast, detail and depth. The film grain still exists, but does so in a way that preserves the filmic quality of the movie. “About the Scores” allows you to watch Safety Last! with either Carl Davis’ 1989 orchestral score or an alternate one improvised by organists Gaylord Carter in 1969. There is an audio commentary by film critic Leonard Maltin and Harold Lloyd archivist Richard Correll. The two men discuss Lloyd’s everyman appeal and also provide brief biographical sketches of key cast members and how they came to this movie. The two men talk about how the movie is a fascinating snapshot of the times in which it was made on this engaging and informative track. Harold Lloyd’s granddaughter Suzanne introduces Safety Last! and talks about his knack for innovation. She offers personal recollections of what he was like. Also included are three short films, including “Take a Chance” (1918), “Young Mr. Jazz” (1919), which celebrated the Jazz Age, and “His Royal Slyness” (1920) that saw Mildred Davis take over as his leading lady. All of these films feature optional commentary by Correll and film writer John Bengtson. “Harold Lloyd: The Third Genius” is a two-part, 51-minute long documentary made in 1989 about the life and career of the silent movie star. It features archival interview footage with Lloyd and reminisces from friends, family, collaborators and famous admirers. Interspersed throughout are clips of classic gags from his films. The documentary traces his humble beginnings to the height of his being a successful movie star. It acts as an ideal primer on the man and his movies. “Locations and Effects” examines Lloyd’s groundbreaking use of stunts, locations and effects. It takes us through key Los Angeles locations that he used in the movie (and others). This featurette also takes a look various effects, like how he achieved the illusion of a character hanging precariously off the side of a very tall building. Finally, there is “Carl Davis: Scoring for Harold,” which sees the composer and conductor talking about the score he created for Safety Last! and for others. Davis discusses how he came to doing these scores and his approach to them, paying tribute to the Jazz Age. This is a fascinating look at how silent films are scored.